The first thing I want to say is a very big “thank you” to everyone who has been reading and commenting. This journey really has been about me and for me, although I hoped maybe a few of my friends would take it to heart and be inspired to talk more about human connection and money, and maybe give a little bit extra away. I underestimated the power of Facebook (which led to the Oregonian article written by Nikole Hannah-Jones). And maybe, in these hard times, the power of some positive news. It has been moving, humbling and deeply satisfying to hear from people all over the country and as far away as Scotland that the stories have made an impact. It’s the end of the month and I have thought a LOT about where things go from here. I need to take a breath and let the experiences of the past month settle. I still have lots of questions but I do have a few answers. I have decided that I like giving this way. I will continue to support the causes I care about through reputable non-profit organizations. But I will go back to the bank next week for a small supply of C-notes and will keep them on hand. I will stay alert for opportunities to make a connection and, sometimes, that will include passing along a gift. And, I will keep writing. My goal is at least a weekly post through the end of the year, when I will regroup. After casting about for a plan befitting this momentous “last day”, I decided to head back to the place where it really all began: Fred Meyer (see Day 2: Not a Care in the World). That was the day I let the inner judgments start bubbling up to the surface and the first time I had a conversation with a giftee. I secretly hoped to see the woman from that day and find out how she was doing. A lot of the store employees were in costume; I especially liked one wearing a clerical collar, long black robe and a gigantic cross around his neck. It was hard to tell the shoppers from the employees. I noticed one woman stocking a display of shoes; she had a grim expression and her regular Fred Meyer duds on. I considered keeping the money as a way of prolonging the month of October indefinitely. I saw a young woman wearing slippers and almost followed her. An elderly woman went slowly and painfully by, leaning into her empty shopping cart. In the next aisle was a mother and young girl dressed convincingly as matching zombies, both their mouths painted into a long scar. As we finished the transaction I tried a few more times to get the woman to smile, or at least look at me. No luck. There was no one else around, and finally I kind of leaned in and said quietly, “Hey, I’d like to give you something.” She glanced at me suspiciously, silent. I reached into my pocket, pulled out the $100 bill and held it out to her. “I can’t take that,” she said, grim as ever. “Why not?” I wanted to know. “Store policy. I think.” “It’s not a tip. It’s a gift.” “I can’t take it. But thanks anyway.” She turned and walked away. It was unsettling. Maybe I really wasn’t meant to part with this last hundred. I set out across the parking lot toward home, the woman’s bad humor weighing on me. On the way I passed the bottle return and then spotted a Salvation Army donation trailer. A couple of cars were parked nearby. The drivers had gotten out of their cars and were handing items to a stocky middle-aged man. A bag of clothes and an old computer monitor disappeared into the dark trailer. After the cars took off I struck up a conversation with the guy. He told me he’d been working for Salvation Army for about two months, first in the Happy Valley store and now here. He said he came from Cuba nine years ago and had originally lived in Miami and then Georgia. He still has family in Cuba as well as all over the world – he counted off children, sisters and brothers, and said his mom had died not too long ago. He’s all by himself here. It always amazes me how much of their story people will share with a stranger, and I was grateful for the connection. I told the man that my mom had also died recently and what I was doing to honor her memory. I handed him the C-note. His eyes flew open, then he kissed the bill and started praying in Spanish. His eyes welled up with tears. He reached out to shake my hand then changed his mind and gave me a big hug. “My name is Carlos. Thank you. You have no idea what this means to me right now.” He said he works three days a week and gets paid $8.50 an hour; it’s really not enough to get by and he was a hundred dollars short on his rent. Carlos thanked me again and encouraged me to come by sometime and say hello. He works Sunday, Monday and Tuesday. 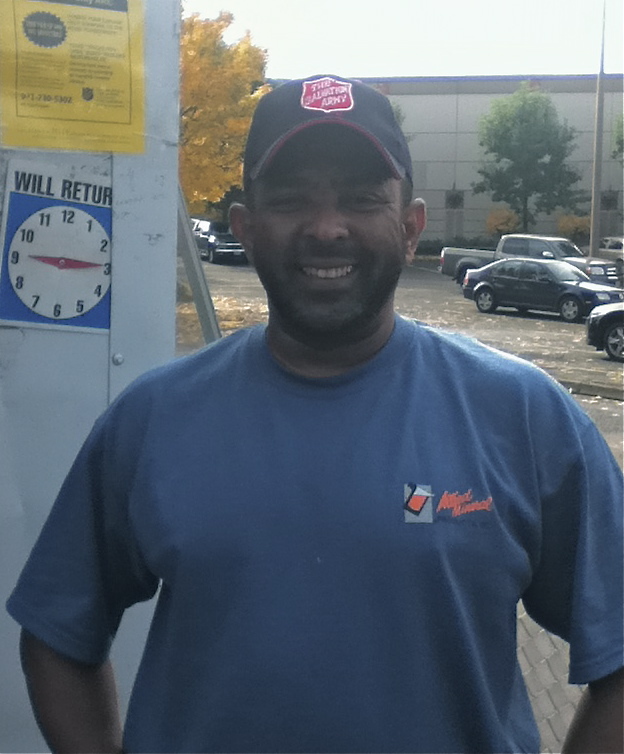 He let me take his picture, but wanted to put his Salvation Army cap on first. He took off the dog’s tiny blanket to show me that she was, indeed, a service dog wearing an official service dog uniform. The passerby had apparently apologized in what felt like a sarcastic manner and then cuffed the guy on the back of the head. It was a deeply offensive gesture. 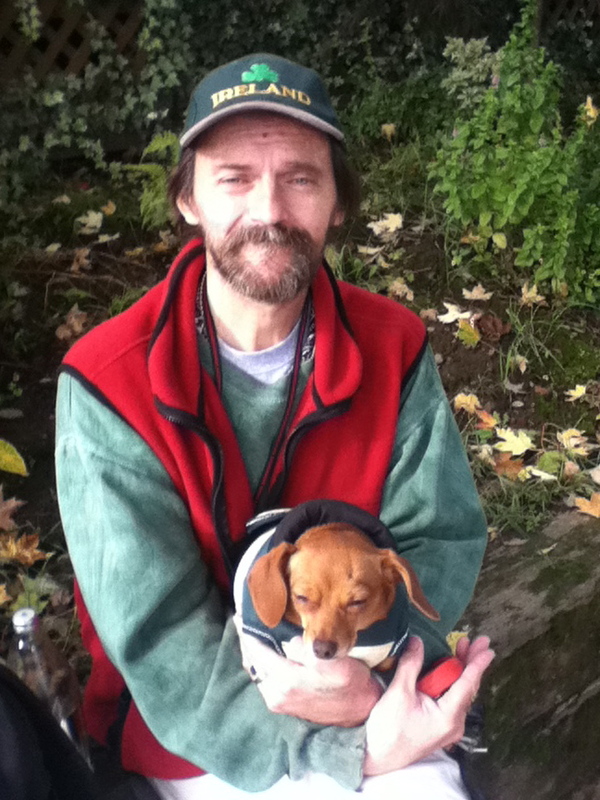 He said his name was Michael and introduced me to his dog, Baby. “You can pet her if you want. She’s a sweetheart.” Michael told me how his wife had died of ovarian cancer and now the dog is all he has. “I’ve had seven heart attacks in five years. I’m on the street. If she senses something is wrong, she licks my face and then I go to the hospital.” The dog has saved his life on four occasions. I can still pick up a whiff of Carlos’s cologne on my jacket. Your stories have been amazing and captivating. Thanks so much for what you did and for sharing all of your experiences with us. Dear Jill, I am reading your last post. You have made me see a small place in me that really is beautiful. Having been one to meet you eye to eye and then accept your gift, and then have the unbelievable pleasure, hearty chuckles, and some pain in reading your posts, THANK YOU. I have not read all your posts; giving me time to begin to understand the experiences, feeling the connections and sustenance. I saved many and will now begin to read them all, and send them to my friends and family. I can see why you would want to continue to give in this way. I feel more gracious, kind and loving too, somehow vicariously being you. After reading this post how could anyone think their problems are that bad? Told you it was addictive. When this is done, we really are being ‘led.’ Classic example, Carlos. Someone sent you as an answer to prayer. You are now officially tuned in. Bless you as you continue this new path that has enlarged your heart and life. Thank you. Yes, my heart is full. Carlos was the PERFECT last recipient! But Michael’s final remark to you was totally eerie, and incredibly fitting to your story… who says that angels don’t exist?! Proof positive! I have been reading everyday, I find it difficult to comment because I can’t find the words, so I stopped for a bit to find the words. It’s put a lot of my experiences in a different light. My family was homeless 7 years ago, when I was 13. You giving a c-note to a woman who didn’t have a place to stay that night brought tears to my eyes. The picture of her in a liquor store made me think of my alcoholic father, whom I try to avoid thinking of. It made me rethink some things. But, most recently, I am waiting for the bus to take me home. I had a conversation with a complete stranger about my age. At first I was defensive, and then I thought of you and you gifts. I had an amazing conversation and was able to find the strings that tie us together as people. It reminds me of a flier at my college, a reminder to be kind to people because everyone is fighting their own battles. I think you have changed as much within you as you have changed outside of you, as we read these blog entries that you are doing. If I ever met you on the street, I would thank you. You have reminded me that there is kindness. I had what most would call a difficult upbringing, to say the least, but it doesn’t have to define the way I see the world around me. That is the gift you’ve given me by writing this. Portland is a little brighter, and I love being here a little more. Jill, thank you so much for your Month of Hundreds, your gift to us. Since finding your blog, I’ve followed every day of your experiences with joy. Today, you made me cry. You, and we, are blessed. Jill, October, 2010 is a month I’ll always remember – you have touched so many people – I’m hoping to be able to follow your journey – God Bless You! As always a very poignant story. Kudos to you for trying to chip away at the barricade built around your first intended recipient. You understood that something has caused her to become so guarded. And then there was Carlos, sharing his story and overcome with emotion upon receiving your gift. You have given me the gift of not being so reluctant to strike up small talk or conversations with strangers. Even the license to smile more freely is an act I’ve been practicing with less intrepidation. You have shown me that most people are more than happy to make a connection, they just need an opening. I am looking forward to following your journey wherever that may take you. Thank you, Jill. PS. my dad was born in Hoboken in 1903. He was 53 when I was born. His relatives owned a gas station in Seacaucus. And I am from Little Neck, NY originally. Lived next door to a wonderful German Jewish family whose close family members were killed in the concentration camps. They impacted me greatly. Jill, thanks for allowing me a seat on the bus for this journey into your inner heart and mind. It is a lovely landscape filled with endless color and possibility. I am reminded once more of the things I was drawn to in you when we met those many years ago. I think that happiness does run in a circular motion and that we change the world (beginning with ourselves)one person at a time. You have modeled many ways for us to be intentional and creative givers. Heart to heart, it is a golden thread that connects and binds. Peace and a cyber-hug, P.
Jill, I have so enjoyed reading about your adventures. Believe it or not, I couldn’t sleep last night knowing that yesterday was the “last” day of your project. I thought maybe you’d get robbed and mugged and that your intended recipient would get jail time instead of your gift! The woman with the bad humor was kind of a bummer, but Carlos and Michael more than made up for it. Michael showed that you can still give when you have nothing. I’d like to hear your ideas about how to connect with people without the c-note. I could do it and will do it, but not for a whole month. Do keep writing. world, and I hold in my heart not just you, but ALL those souls who have responded and will keep this beautiful adventure going forever! Jill, the thing I kept thinking about after reading your experience with this last $100 and the woman at the checkout counter who refused your gift — proof that money can’t buy happiness:) The way I see it, our problems generally fall into money, health or relationshp issues. I’d take money problems any day of the week over the other two. The checkout lady’s problems couldn’t be lightened by money….but maybe later, in a private moment, she’ll think beyond the $$ and find comfort in knowing that another human was trying to reach out to her. Anyway, again, I just want to thank you for letting us in on your soulful journey in October. Dear Jill, how many hearts you have touched in a such unexpected and fulfilling way. It is so nice to continue being in touch with you via your heartwarming on this blog. I myself am struggling with relationship with money as I had none for a most part of my life and when the situation changed I realized that my fear is just the same…So through working on things that help people something ‘clicked’ and I feel that change is slowly on its way … I don’t have answers yet but I feel they are coming…I’ve been helping my family back home and single mom’s in developing countries via Kiva and feel it is time to look around me and connect …. Sanja- I am so grateful that our paths crossed. Thank you for this sweet note and for who you are. BEAUTIFUL. You are simply beautiful. Thank you for the gift of sharing this journey. I decided not to comment until I got through the entire 31 days. What strikes me most is your ability to connect with others truly, but then let go. I’m sure it’s a skill honed as a physician but it is beautiful. It allows you to really share with other people without being crumbled by the intensity of all these different lives. When I was younger I felt really able to do that. Now as I have family, responsibility, work stress, I feel those walls go up. I need protection. That was the beauty I saw in your stories, is the vivid connection with others. That’s the inspiration I’ll try and follow up on for myself but also to teach and foster in my kids. Thank you again.